The painting depicts the moment when Romney has been refused and is about to take his leave. Aurora holds a book of her verses which Romney has found in the garden and made fun of. Miss Heaton and Hughes disagreed over which scene in the poem should be depicted. The patron had wanted an earlier incident, but in a letter dated 14 December 1860, Hughes said, 'The moment I chose to paint was the best - Romney turning away ... If I had not chosen that moment, the story as Romney's dismissal would I think have been confused - it would rather have seemed a quarrel of which we did not see the end nor know the cause' (Mander, p.222). Ruskin sided with the artist. 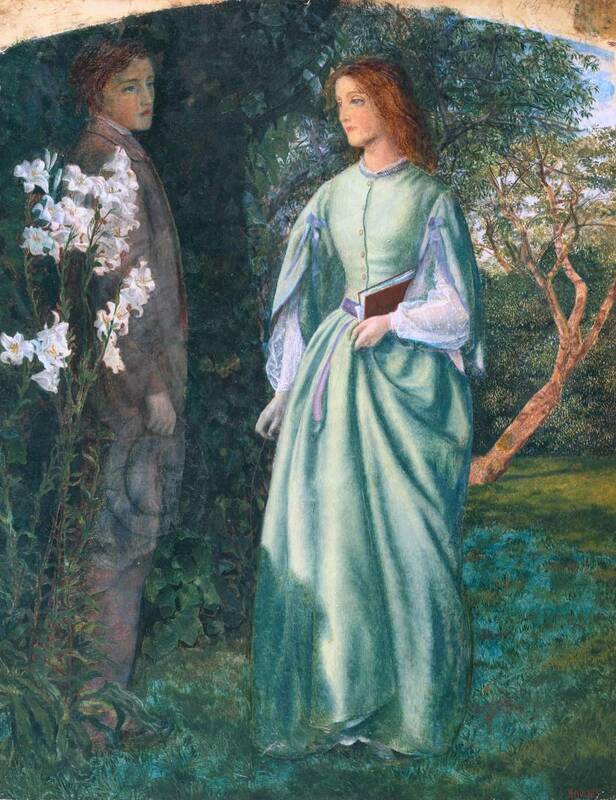 Miss Heaton also wanted Aurora shown in a white dress as in the poem, but Hughes felt that a sea-green dress would better complement the landscape. He had trouble with the composition, and asked Miss Heaton in the December letter 'kindly to pay me the price of the frame 632 - separate from the thirty guineas for the painting, as it has really cost me a great deal more time than I thought such a subject would have' (Mander, pp.222-3). He painted out Romney's hat twice; the overpainting has since become transparent, and traces of the two hats can be seen. He may have used himself and his wife, Tryphena, as the models for the figures. Miss Heaton must eventually have become reconciled to the picture, as the same month she commissioned from Hughes another painting, That was a Piedmontese ... (1862, Tate Gallery N05244), which again required Ruskin's intervention to mediate between the two parties. Aurora Leigh's Dismissal of Romney was never exhibited in Hughes's lifetime, and remained virtually undocumented and the subject unidentified until Rosalie Mander's 1964 article '"The Tryst" Unravelled', in Apollo. It's not a volume of her poetry but instead it's a volume of Greek verse she was reading when Romney comes upon her - which Romney tells her is unsuited for a woman - 'lady's Greek - without the accents' - when EBB had already published with a fine Greek scholar, Sir Uvedale Price, on precisely the tonality of Greek with the accents! EBB is recalling here, however, Robert's scorn at women writing love sonnets, why she hid the Sonnets from the Portuguese from him until after the birth of their child.